This article briefly compares OPC Xi with Classic OPC and OPC UA, and provides an overview of OPC Xi. Industrial plants have been successfully using OPC for the secure transportation of process control and automation data since 1996. To build on the success of Classic OPC, the OPC Foundation has been working diligently on new specifications to help secure the future adoption of OPC. In 2009, the OPC Foundation released OPC UA (OPC Unified Architecture), which enabled companies to embed OPC Servers on PLCs, ensure Operating System platform independence, and provide a rich industrial information model. Then, to help with rapid application development using .NET, they released OPC Xi (OPC Express Interface) in 2010. This article briefly compares OPC Xi with Classic OPC and OPC UA, and provides an overview of OPC Xi. All OPC specifications have the same main objective: securely transport industrial data between automation applications on separate computers. However, each specification has a slightly different objective. 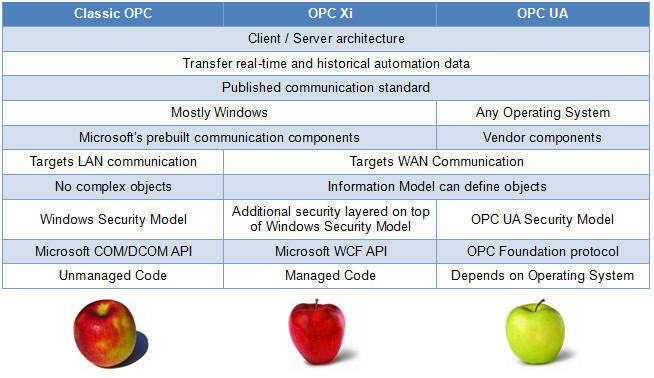 Comparing OPC technologies is not a matter of the difference between apples and oranges, but rather between different types of apples. The OPC set of specifications that is right for an individual plant depends on the specific application objectives, communication vision, vendor product availability/cost, and integration restrictions. As the name implies, the motivation for the creation of OPC Xi is simplicity and speed. Programmers can quickly develop automation applications, integrators can apply existing knowledge for efficient deployment, and end users can use OPC in any plant network environment, no matter how complex. While Classic OPC relies on DCOM, OPC Xi relies on WCF (Windows Communication Foundation) to transport data. This is a key design concept for OPC Xi because vendors strive to increase application reliability while simultaneously decreasing product development time. For this reason, programmers are developing client applications that execute inside Managed Code. A Managed Code environment enables Windows to capture application errors without crashing (thus avoiding the dreaded “blue screen of death”). Microsoft’s .NET set of tools provide this Managed Code environment, and they use WCF (Windows Communication Foundation) to transport data. The COM/DCOM communication infrastructure of Classic OPC uses Unmanaged Code and so it becomes time-consuming to integrate newly developed .NET clients with existing OPC DCOM servers. To solve this problem, OPC Xi was developed to provide a standard .NET wrapper for existing OPC servers. Security is a key concern for plants that need to transport data across a network. WCF automatically provides applications with a secure communication infrastructure that provides all the necessary security services for Authentication, Authorization, and Encryption. Programmers do not need to make any special considerations for these security services, and they can leave the decision to either allow or deny access to specific User Accounts and Groups to the plant itself. Therefore, network architects and integrators can make security-related decisions at deployment time and can easily modify security settings afterwards to accommodate new requirements without having to ask their vendors to make any software changes. OPC Xi layers additional security on top of the WCF security mechanisms. This additional security provides for restricting read, write, and subscribe access to servers based on the location and identity of the client application and the protocol it uses to access the server. For example, the server may disallow write access to the server if the client is accessing the server across the web using http. Plants can quickly deploy OPC Xi applications across networks of any size. WCF works with standard network equipment and protocols, which enables IT (Information Technology) personnel to comprehend and approve architectures. IT and Automation personnel do not require specialized or proprietary knowledge to assemble their systems; they can work together to meet their respective goals. From small open networks to large networks that must comply with the most stringent of federal security regulations, Microsoft designed WCF to traverse all existing network equipment. Plants can configure OPC Xi to communicate across network equipment and appliances such as routers, switches, firewalls and NAT (Network Address Translation). WCF provides programmers with the ability to use XML web services. So, they can design applications to work on any operating system, such as UNIX, Mac, or even VxWorks. This will enable vendors to develop OPC Xi clients on the platform of their choice (like a PLC, Analyzer, RTU, Intelligent Electronic Device, etc). However, since XML web services are slower than native WCF binary communications (which can transfer thousands of points per second), high performance applications should not be designed to use web services. Therefore, if speed is an issue in cross-platform applications, OPC UA (OPC Unified Architecture) is an outstanding alternative. With the release of OPC Xi, the OPC Foundation is securing the future of OPC. OPC Xi enables plants to replace their existing reliance on DCOM with WCF. OPC Xi builds on the success of Classic OPC and the innovative architecture of OPC UA. OPC Xi enables vendors to quickly develop reliable automation applications, and plants to sharply increase the penetration of OPC in their facilities. Randy Kondor (randy.kondor@opcti.com) is the lead instructor of the OPC Training Institute, the world’s largest OPC Training company. Since 1996, Randy has been extremely involved with the OPC industry and a strong supporter of the OPC Foundation. Kondor also serves as the Vice President of Education for the OPC Foundation. He continues to dedicate himself to spreading the OPC Foundation's message about system interoperability and inter-vendor cooperation. Lee Neitzel (lee.neitzel@emerson.com) is the Senior Technologist for Emerson Process Management. Neitzel led a multi-vendor development team to develop the OPC Xi set of specifications and is an active supporter and promoter of OPC Xi technology. Neitzel also serves as the IEC SC 65E Secretary (Devices and integration in enterprise systems), and is the technical lead for Foundation Fieldbus H1 and HSE Communications Specifications. Thomas J. Burke (thomas.burke@opcfoundation.org) has been an officer for the OPC Foundation since the start of OPC, currently serving his fourth year term as President of the OPC Foundation. Burke was one of the founding members of OPC; he was the architect for the OPC Data Access Custom & Automation Interfaces. He has served as the designer and leader for the OPC Compliance, OPC Interoperability, and all the OPC Data Access specifications.